Last Memorial Day weekend, skydiving changed my life! If you read that post (and this one… and this one) you know how much I looooove being in the air. So, this year, rather than jump out of a plane, I decided to cross another sky-related item off my bucket list: flying a plane. Because Discovery Flights are frequently purchased as gifts, Tampa Bay Aviation actually sends a gift certificate once you pay online. You then have 6 months to call and schedule a flight at one of three local airports. I chose the Friday before Memorial Day at the Clearwater Airpark in Clearwater, FL. In a nutshell, a Discovery Flight is 15 minutes of on-the-ground instruction, then 30 minutes of air time. 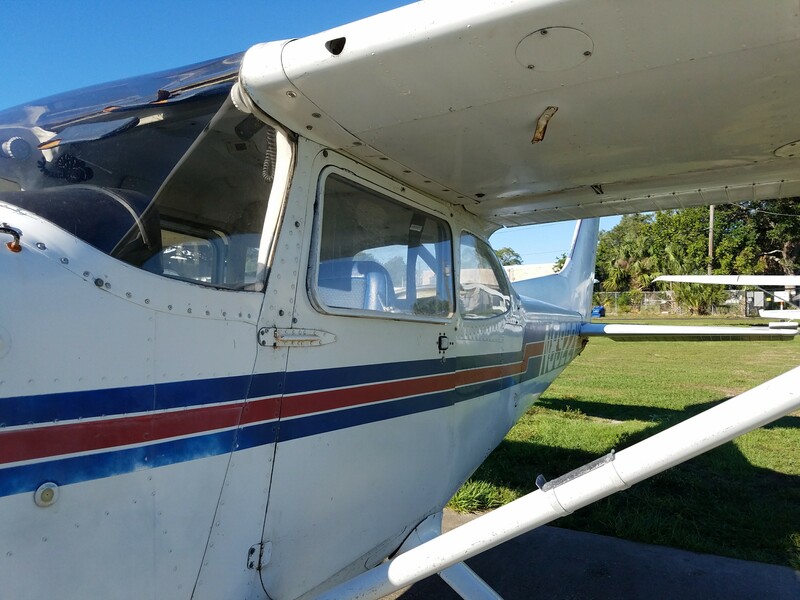 My instructor, Daniel, walked me through the pre-flight inspection for our single engine Cessna 172, introduced me to the control panel, gave me a headset, and we were ready for takeoff! 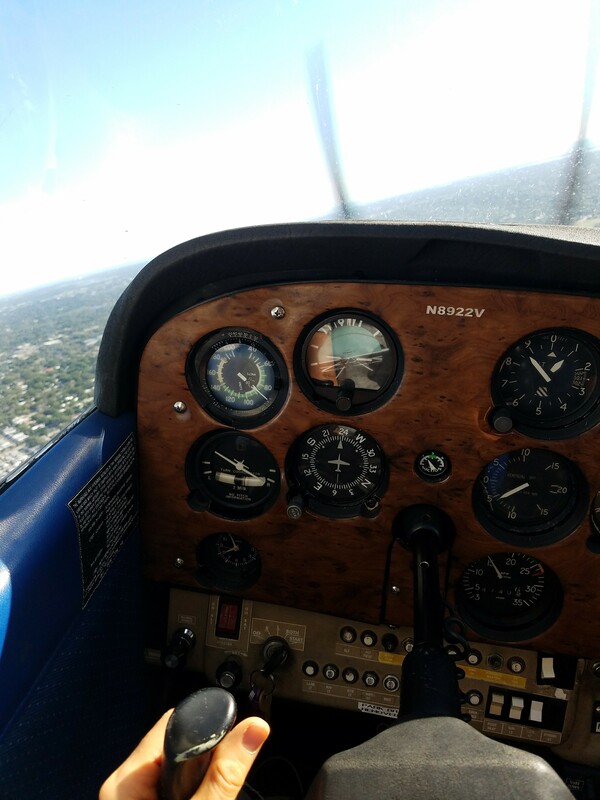 Let me first clarify that I did not have control of the Cessna during takeoff (or landing… or when I took the in-flight photos!). Once we reached a level altitude, Daniel then handed the reins over to me and told me which direction to fly. 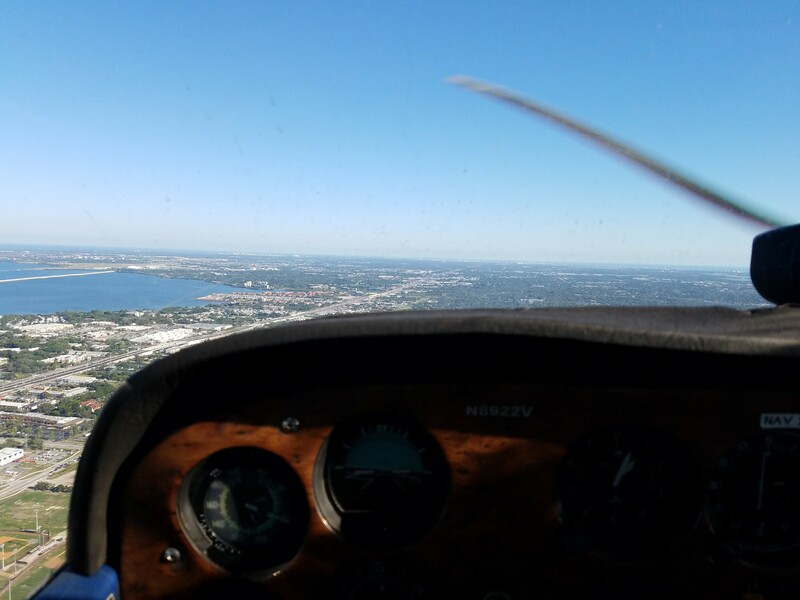 Being in Clearwater, we flew right over the beach and I managed to gawk at the views while also managing the controls. The day was brilliantly sunny and clear, which made those aerial shoreline views extra stare-worthy! Of course, time flew by (pun intended) and far too soon I was pointing the plane back toward the airport for our descent. After aligning the plane with the runway for Daniel, I sat back and observed as he executed a swift and smooth landing. He made it look SO EASY – and even tried to assure me that it actually was. 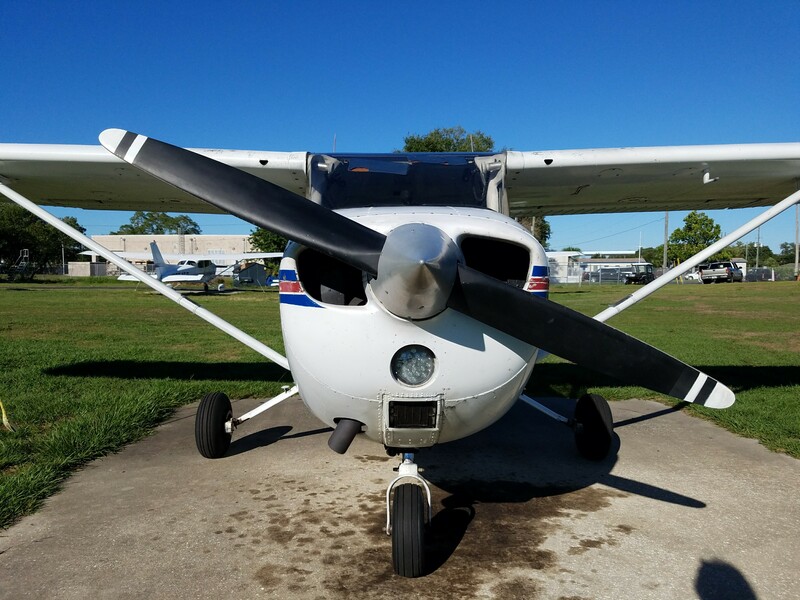 Though I have no intention of earning my pilot’s license, I am so, so glad I booked this Discovery Flight – and not just for the bucket list! While quick, it was a new challenge, a real adventure, and fuel for my passionate pursuit of a life well lived. Also, Tampa Bay Aviation made the entire process a breeze! No paperwork. No delays. In fact, I was late for my appointment (thanks to missing an exit because I apparently can’t talk on the phone and drive at the same time! ), and the receptionist kindly told me to take my time and they would wait for me. Then, my instructor, Daniel, could not have been kinder, more patient, or more passionate about his job. It was 100% worth the $69.95 and hour drive from Sarasota! So, what’s next on my sky adventure list? Well, Tampa Bay Aviation also offers Discovery Flights for multi engine planes, as well as helicopters – and, given my ‘adrenaline junkie’ post, there’s no doubt the helicopter flight WILL happen. ASAP. I also have my heart set on a non-engine flight – in a hot air balloon – so don’t be surprised if I blog about that adventure first! Have you ever flown a plane? Or helicopter? Or experienced a hot air balloon ride? If you’re a sky adventurer like me, I’d love to know! Yes. I Have a Thrill Ride Bucket List. Congrats Jayme! I still haven’t done this yet. Soon! Thank you, Todd! And you MUST! Promise me you will soon 😉 and let me know when you do!